Thanks all, for the notes and good wishes. These have been passed-on to Tony. In addition, I have received updated details from Tony, in relation to the charitable donations mentioned earlier. If doing so, please can any cheques be made payable to "The Prostate Project". Thanks for posting that. Nice obituary, sums up the man beautifully. I had the pleasure of having dinner with geoff sunday night at laon last year, having been there many years with him. The meeting will not be the same again. A further update for the benefit of those attending the funeral. It has been proposed, that the best way to honour Geoff's inimitable sense of humour and unique dress sense, would be if everybody dresses in light, bright colours, a fitting tribute to a man who brought colour and individuality to the world of Reliants and classic cars in general. I was never fortunate enough to meet Geoff and, having read this thread, I'm sorry I didn't. But I am very familiar with his contributions to the Forum. 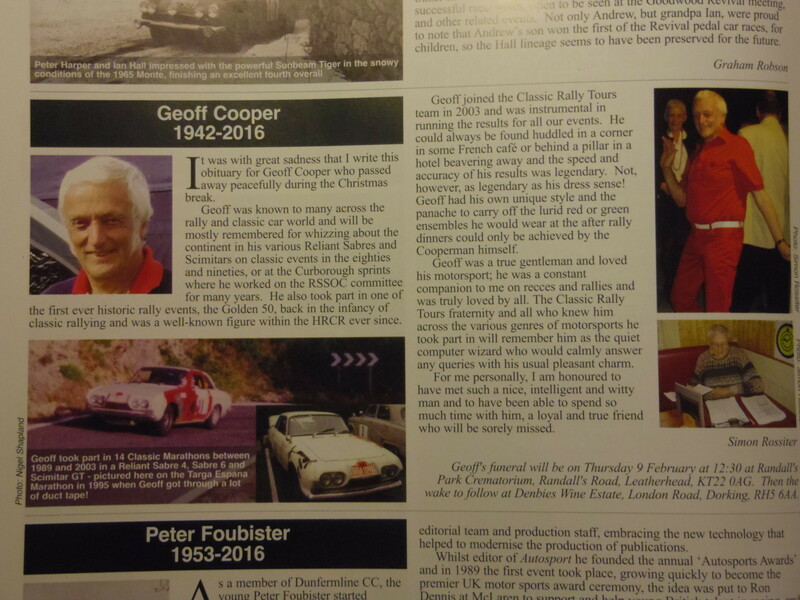 I'm too far away to have attended today, but my thoughts were with Geoff's family and all of those who were there. I've made a small donation in Geoff's memory. I was working on the car, it seemed appropriate. DARK STAR wrote: I was working on the car, it seemed appropriate. So was I kind of fitting for a fellow scim nut!! Yes, we certainly saw Geoff off in style! The Crematorium car park resembled a classic car rally with Scims, Lotus Cortinas, Volvos, Jags and MG's to name a few! Inside, it was completely full and many had to stand down both sides and at the back, a really great turn out. Many familiar RSSOC faces attended, including current members and many from years gone by and was great to see them again and say hello. Standing room only in the crematorium, great eulogy from Simon Rossiter and a celebration of life in a function room at Denbies vineyard afterwards with many stories and catching up. Cars in attendance included a couple of Lotus Cortinas, a Sunbeam Tiger, Mk1 Daimler/Jag, MGA, MGB roadster and GT, Stag, Amazon, lots of BMWs and Scimitars. It is amazing just how many people Geoff had some story personal to them about their friendship with Geoff. I did the timekeeping with him on some rallies, (in addition to our scimitar coupe connection) and as Simon pointed out; we always had the most comfortable seat at any location where we did the time cards. Many of us have his 'blade fuse' box in our cars, making life so much easier. He will be missed but had a great send off and it was good to hear his cars are going to safe hands. Sounds like a send off Geoff would have been proud of himself, personally I was gutted that work prevented my attendance, he'll certainly be missed by myself as well as many many more besides. I think they ran out of standing room at the Crematorium - it was certainly tight for parking (and some lovely machinery in attendance). It was a wonderful send off; great words from Simon which raised a giggle at times, reminding us all of the Geoff we knew. RIP Cooperman - may your time tables and spreadsheets guide you onwards. Sounds like a decent tribute to a man who clearly inspired great friendship and provided many memories and fond anecdotes for friends.